If you want to take your practice to new heights, using a yoga swing might help. Freedom from gravity empowers the body to accomplish deeper backbends, more invigorating inversions, and greater tests of strength. If you've wondered at the abilities of acrobats or flying trapeze artists, imagine being able to combine the two skills together. A yoga swing is a suspended system of fabric, ropes, and handles that allows you to move vertically or horizontally in the air. The longest and widest fabric piece supports the pelvis, which enables you to extend your limbs and bend forward or backward with ease. Yoga swings are popular tools in Antigravity Yoga and other types of acrobatic yoga. OmGym reated this demo video to show the many ways you can use these devices. Most swing manufacturers do not recommend women participating in this activity while pregnant. Additionally, just as with a mat-based yoga practice, avoid swing inversions while menstruating. Weight is not necessarily a factor with yoga swings. However, you'll have to evaluate both personal weight and the suspension system to determine maximum capacity. The average swing can accommodate 250-300 lbs. It's not advisable to feature two people on the swing at once. Most swing models can be suspended from a tree limb, door jam, ceiling hooks, cross beams, or suspension racks that are sold separately. However, the suspension method needs to be secure. For example, you'll have greater support from a cross beam than you will ceiling hooks not set into a joist. Depending on the design of your home and the space needed to use the swing properly, you may consider only using the swing outside on a sturdy limb or using suspension racks. Always use a cushioned gymnastics mat underneath the swing. Make sure to check ropes and fabric before each use. OmGym details more personal safety guidelines and set up recommendations on its website. Extend your body into the fabric straps until you feel resistance. Suspend your body between two straps and do Plank Pose. Use the ropes and handles to aid with pull-ups. Practice Handstand, Headstand, and Forearm Stand by using straps to support your lower body as you flip upside down. Extend all limbs by using the ropes and handles to form an inverted Goddess Pose. Decompress the spine by experimenting with other types of inversions. Practice Wheel Pose using the wider strap to support your pelvis completely. Extend into a form of Camel Pose while suspended from the straps. Make Scorpion Pose more accessible by positioning your pelvis across the wide straps and using the ropes and handles to deepen the backbend. Here are just a few of the manufacturers that offer yoga swings, replacement parts, and suspension frames. OmGym - The base kit includes nylon sling, adjustment straps, handle grips, cushion support, and travel bag. The slings are made from recycled parachute nylon. Prices start at $199. 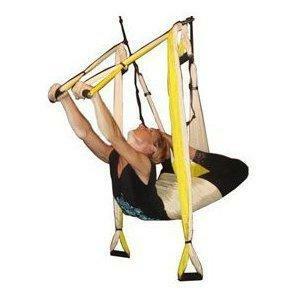 Omni-Gym Yoga Swing - Products on this site include the Sling, the Basic Swing, and the Omni Swing Deluxe. Prices range from $111-$333. By using a yoga swing, a general practitioner can experience better movement through postures simply because his or her body isn't restricted by gravity, body weight, or lack of strength.